Do you know what Colorado’s state tree is? Do you know what could you use as a natural sunscreen if you were stranded in the woods (hint: you can also use it as a natural pain reliever)? Explore fun facts such as these and much more during Keystone’s Ski with a Ranger tour. 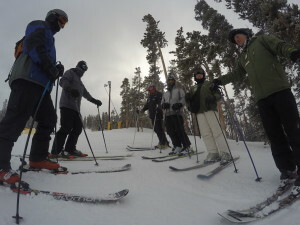 This is an opportunity for the United States Forest Service, Friends of Dillon Ranger District, and Keystone Resort to partner and provide a one-hour tour highlighting the resources of the National Forest and the resort’s environmental commitments. I found the tour to be very fun, engaging, and educational. 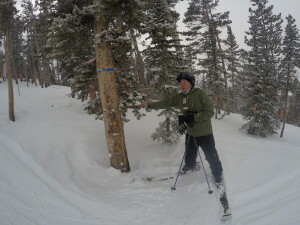 I skied away from the tour impressed with the new facts I had just learned and stories I was told. I continued to show off this new knowledge later that day by challenging my friends with trivia questions from the tour. I went on my first Ski with a Ranger Tour last Friday. 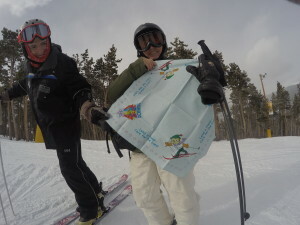 No reservations are required and it is completely cost-free as long as you have a season pass or lift ticket. I met the two forest rangers and four other participants at the top of Dercum Mountain just before 11 a.m. We were given a brief introduction on what we would experience throughout the tour, and we took off skiing down Schoolmarm. Schoolmarm is a family-friendly beginner trail, and the tour involves multiple planned stops along the way. A skier or rider at any level could join this tour, and true beginners can simply let the rangers know their ski ability when you meet in the morning so the rangers can tailor the tour to keep you and your family comfortable. At each stop, the rangers provided information on interesting environmental topics of interest. These topics included some local history, tree types and identification, lifecycle of the Mountain Pine Beetle, local wildlife, avalanche awareness, and helpful facts to be familiar with in case you were in the mountains without easily-accessible first-aid. The tour took about an hour, and most of the participants were eager to stick around afterwards and ask questions. I like how the rangers modify their tours based on the participants that attend. Although there weren’t any children present on the tour that I joined, the rangers showed me some of the free giveaways that children can receive. My group was particularly fascinated by natural medicines the environment has to offer, but I was told that children are usually more interested in the animals and wildlife. If you and your family would like to take the tour, they take place every Friday at 11 a.m. through March 28. All participants should meet on the top of Dercum Mountain, not far from where you get off of the gondola. 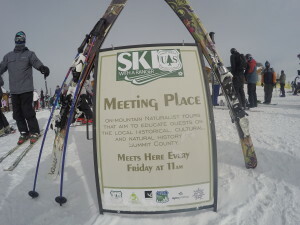 Reservations are not required, and all who wish to join must have a lift ticket or pass. I encourage both locals and families from out of town to attend these tours. The rangers have a wealth of knowledge, and it is obvious they truly enjoy sharing it with others. My tour was filled with good company, laughter, and lots of useful information that I will remember forever.